알코올 중독과 같은 절망, 스트레스, 슬픔, 외로움, 분노와 우울증, 등 관련 약물 중독 장애의 알코올 주류 음료 고통 효과를 한 병 술에 취해 침대에서 알코올 남성. Senior man feeling bad because of toothache. 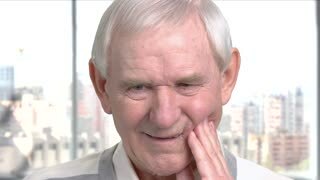 Cheerless elderly man suffering from problem with teeth, window city background.